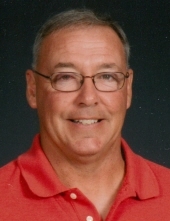 Timothy Joseph Burns, 56, died Saturday, December 1st at UIHC following a sudden illness. Mass of Christian Burial will be celebrated at 11 AM, Thursday, December 6th at St. Peter’s Catholic Church in Cosgrove with Father Robert Cloos officiating. Burial will be at St. Peter’s Cemetery. Visitation will be Wednesday from 3 to 8 PM at St. Peter’s Parish Hall, where the rosary will be recited at 2 PM. In lieu of flowers, memorials may be directed to St. Peter’s Church, Hills First Responders or the Tim Burns Memorial Fund. Tim was born February 6, 1962 in Iowa City, the son of Kenneth and Joan Skow Burns. He was a 1981 graduate of Clear Creek High School. On June 25, 1988, Tim married Kathy Colbert at St. Mary’s Church in Riverside. Tim was employed with the City of Iowa City, where he was a refuse worker since April of 1990. Tim operated a lawn care and snow removal service and farmed the family farm. Tim was a storyteller with a magnetic personality that made people laugh. He loved being a resident of Hills and being involved with St. Peter’s Pork Day, where he drove the train ride. He enjoyed tractorcades, tractor pulls and annually attending the Iowa State Fair. This year Tim took part in the WMT Tractorcade. Most important to Tim was his wife, family and friends. Tim did not know a stranger. Tim is survived by his loving wife, Kathy; his siblings, Mike Burns, Pat (Kris) Burns, Kathy (Jeff) Pitlick, Gerry (Deb) Burns, Jim (Dawn) Burns, Jeanne (Guy) Goldsmith and Shelli (Heath) Mardesen; his father-in-law, Bob Colbert; brothers and sisters-in-law, Julie Colbert, Jean (Bryan) Lenz, Steve (Kathy) Colbert, Tim (Bev) Colbert, Pat (Michele) Colbert, John (Linda) Colbert, and Doug (Barb) Colbert; numerous nephews and nieces whom adored Tim. He was preceded in death by his parents, Kenneth and Joan Burns; grandparents, James P. and Cecilia Burns and Nora and Gerald Skow; mother-in-law, Lucille Colbert; several aunts, uncles and cousins. To send flowers or a remembrance gift to the family of Timothy Joseph Burns, please visit our Tribute Store. "Email Address" would like to share the life celebration of Timothy Joseph Burns. Click on the "link" to go to share a favorite memory or leave a condolence message for the family.